Welcome to my first update about my adventures abroad in Sydney, Australia! So far, Sydney has been everything that I dreamed it would be. I've never been to a city more beautiful and filled with such nice people. Like incredibly nice. Australian hospitality beats Southern hospitality any day. In my first update, I'm going to talk about everything that I've been up to since arriving, and I'll also paint a picture of what a typical week in Sydney will look like for me during my first month. While I'm still getting adjusted to the city that is Sydney, I'm slowly but surely getting my bearings. Sydney is full of neighborhoods with different cultures and vibes. I'm staying in Camperdown, which is the neighborhood to the west of University of Sydney's campus. If you look at the map below, it's the neighborhood to the north of Newtown. 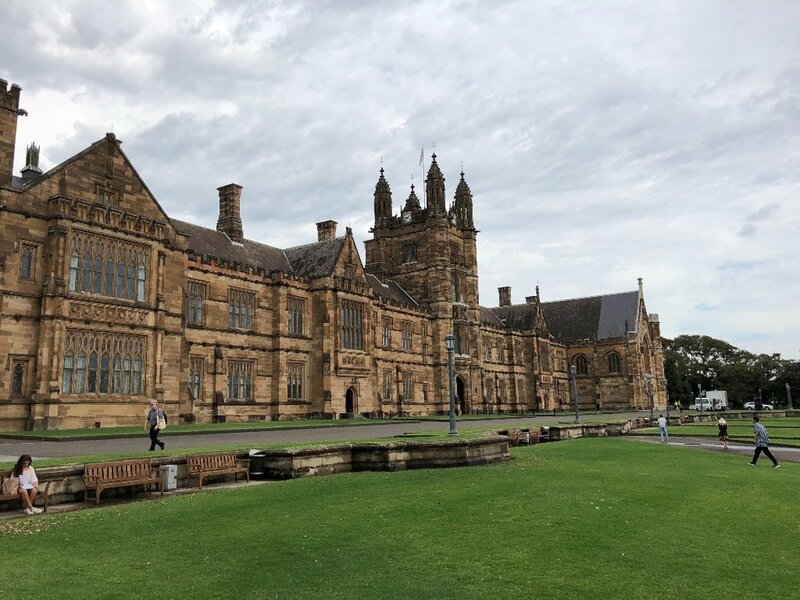 All of my classes take place at University of Sydney's campus, which is located in-between Darlington, Glebe, Camperdown, and Newtown. So far, Camperdown has been a great area to access all parts of Sydney. In a short fifteen-minute bus ride, I can be in the CBD (Central Business District) where my internship at General Assembly is located as well as all of the skyscrapers of Sydney. 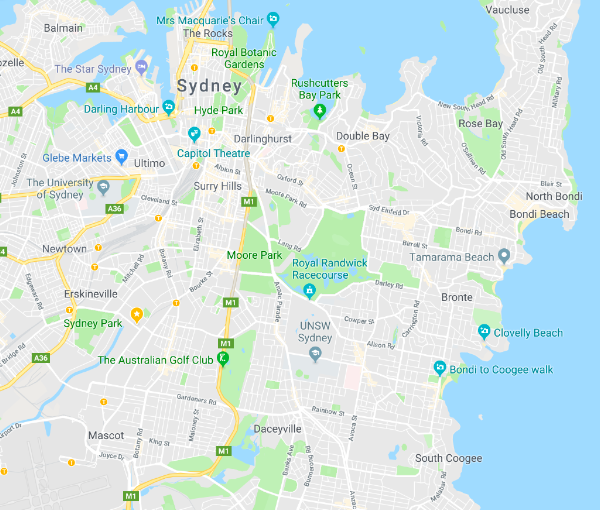 If you look at the map, the CBD is the neighborhood with Hyde Park and Royal Botanic Gardens - this is also where you can find the Sydney Opera House! Throughout these updates, I will refer to the different neighborhoods of Sydney - so if you get lost, just check out this picture or a map of Sydney. It will definitely help out. Since I am in Sydney to study abroad, let's start off with the school. In the five months that I'm here, I will be studying abroad at the University of Sydney - or Sydney Uni, as they say it here. The University of Sydney is hands-down the prettiest university that I've ever been to. You still have my heart, Georgetown, but the University of Sydney is absolutely breathtaking. The buildings of the campus are mainly historic and old, but the campus is also scattered with buildings that are modern and sleek. And in Aussie fashion, the university is sprawled with trendy cafes as well as places to eat and drink. At the moment, I'm taking Psychology 1001 during their summer term, as January and February are part of the summer months down here. The class meets on Mondays, Wednesdays, and Fridays until February 14th. It's made up of lectures and tutorials - a tutorial is their version of a discussion section. The class aligns well with my Management, Leadership, and Innovation major at Georgetown, so I'm excited to take a class in this field for the first time. During my first month in Sydney, I'm also interning at the education technology company General Assembly on Tuesdays and Thursdays. General Assembly maintains campuses in numerous countries throughout the world and teaches entrepreneurs and business professionals practical technology skills. The organization directs its focus on providing courses in mobile and web development, data science, product management, and other digital-related courses, helping graduates of their programs gain the best-in-class instruction and providing access to opportunities in technology. So far, I'm absolutely loving my internship. I'm interning in the Marketing and Business Development departments, and I'm planning several moderated panels on topics such as technology and innovative capital. More updates to come! The office looks straight out of Silicon Valley with great access to Darling Harbor, and my fellow employees have welcomed me with open arms. After being greeted with a gift basket on my first day, I've already explored several restaurants and cafes with them that other "locals" go to. Last, but definitely not least, I'm adventuring around Sydney in all of my spare time. Although I'm here for five months, I'm already worried that I'm not going to be able to do everything that I want to do in this city. However, I'm going to do my best! So far I've gone tanning at Bondi Beach, toured the Sydney Opera House and Sydney Harbour Bridge, danced at a silent disco and at the largest club in Sydney (and that I've ever been to), walked Centennial Park and the Bondi to Coogee Walk, and brunched. Brunched a lot. And that's a wrap of my first week in Sydney!